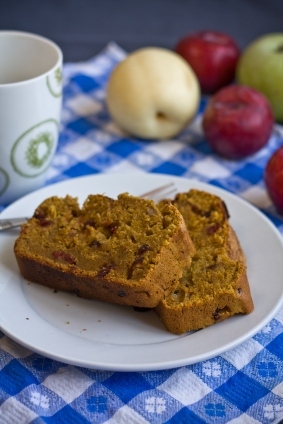 If you are looking for an easy recipe for pumpkin bread, you've found it. This beats the others hands down. I have two secrets to making perfect pumpkin bread. My first secret to perfect pumpkin bread is using fresh pumpkin puree. My second secret? The glaze. I also offer a pumpkin cinnamon bread recipe with cream cheese frosting below. After years of research and combining recipes and techniques, I'm pleased to bring you the best pumpkin bread recipe - using fresh pumpkin. It really makes a world of difference. There are so many ways you can customize this basic recipe to highlight your own personal style, that you'll want to make multiple loaves just to experiment. Remember, pumpkin bread freezes well, and makes great gifts for the holidays. Make this a family tradition during the holidays. You may also use muffin tins. I also double the glaze recipe. Here's my recipe for pumpkin bread. The. Best. PREHEAT oven to 350 degrees. Grease and flour a tube pan. In a large bowl, mix pumpkin, eggs, oil, apple sauce, vanilla, water and sugars until well blended. Sift the dry ingredients together and add to the pumpkin mixture, stirring until just combined. Fold in the walnuts and raisins; pour into the prepared pan. Bake for 70-90 minutes or when a knife inserted in the middle is clean. To make the glaze, melt 1/2 cup butter and add brown sugar and cinnamon; stir to dissolve. Poke holes in the cake and drizzle with this hot mixture. Use the recipe above for the basic pumpkin bread. Following are the changes. 1. Make up a mixture of 1/2 cup white sugar and 1 tablespoon of cinnamon. 2. Instead of buttering the loaf pan and dusting with flour to bake, butter the pan and use 1/4 cup of the cinnamon sugar. Set aside. 3. Set out 1/2 stick of butter (1/4 cup). If you need more, just set out the entire stick to soften. Blend the butter with the remaining 1/4 cup of cinnamon sugar and use that to butter the warm banana bread with. It's delicious. I didn't put cinnamon in the loaf of bread, for those that may not like it, but feel free to add 1 teaspoon to the batter if you wish. Use small to medium size baking pumpkins. Slice pumpkins in half, clean out and remove seeds. Fill halves 1/2 full of water, and bake in a covered (or larger) dish. Bake for 30 to 45 minutes or until pumpkin is very tender when poked with a fork. Cool, and put immediately into a blender and make puree. You may need a little more water to process until it's smooth. Now it's ready for the recipe. I have a recipe for pumpkin bread that my Mom used when I was young. Just thought I would post it here for safe keeping. This recipe for pumpkin bread is my Mom's. PREHEAT oven 350 degrees and grease and flour 3 loaf pans. Mix ingredients and bake in greased and floured loaf pans. Bake for 70 minutes. Makes 3 loaves - great for freezing.